In the spring of 2011, Tom Kuthy, a Colorado Springs Internet marketing consultant, hired MintCopy to write search engine optimized copy for Online Dancewear. One of the top dance wear e-commerce sites in the U.S., Online Dancewear boasts a wide selection of thousands of in-demand items within its online catalog. The objective of the copy writing project was to make Online Dancewear’s ecommerce website more competitive in organic search by having both keyword-driven copy and meta data, and also ensuring the copy is compelling and well-written to increase conversion on the site. To get started, WSI prepared a briefing document for MintCopy containing an outline of the 73 category pages and sub-category pages. Each page was assigned a primary keyword as its focus, which was directly related to the content of the page. Visit Online Dance Wear, => select leotards, => and then select leotards for girls. 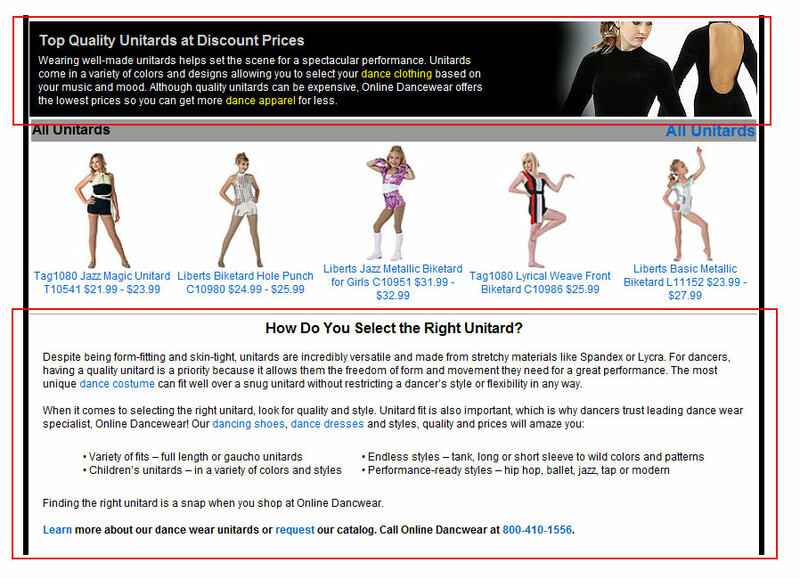 From the sub-category page leotards for girls, a user would then see a listing of possible products in that sub-category, for example the Liberts Combo Dance Costume Leotard. The copy on this site is typically between 50-100 words above products and 150 words below, and contains a strategic use of the keywords being optimized for, such as: capezio, tutus, leotard, dancewear, tap shoes, dance clothes, ballet slippers, character shoes, dance clothing and dance tights. Links to other parts of the website were built into the copy to increase internal link structure, and clever language was created to engage the customer in the content. In addition to delivering on-page copy, MintCopy wrote and delivered meta descriptions, title tags, and H1 header tags. Since implementing the new Online Dancewear copy, dozens of new pages have been indexed, and organic traffic and conversion are increasing rapidly. Based on these and other results achieved, WSI Colorado Springs has expanded its relationship with MintCopy to include additional high profile clients.